Use up the yarn in your stash or create a great, last-minute gift with this downloadable collection of 25 free, easy crochet patterns. These patterns require little yarn and little time to create, making them economical and fun. You can sit down to crochet with a movie and have a dishcloth, flower or bookmark by the time it's over. Free patterns for crochet can help you save money on home decor, wearables and so much more. When you stay home and create your own items, you're saving yourself the temptation of spending too much on a generic item that so many other people possess. Instead of heading to a home decor shop, spend a night working on baby crochet patterns for afghans and quilts - you'll be so proud of your work and will want to show your piece off to everyone. When the spring comes, find out how to crochet flowers - no water or food required! Simple crochet patterns are the best when it comes to stretching your creativity and testing your talents. You don't have to conquer an impossible pattern - make something you know you're capable of finishing. Patterns like the ones in this free eBook are meant to provide you with a fun and thrifty alternative to buying items in store. From free baby crochet patterns to easy crochet patterns for dishcloths, you're sure to find a great project idea in this free eBook. Who doesn't love quick and easy crochet patterns? If you're looking for a fun afternoon activity, you can't go wrong with simple crochet patterns for flowers, bags and even booties. Looking for a homemade gift you can make in a flash? Easy to crochet patterns for projects like yarn-covered hangers are sure to do the trick. Men will surely appreciate a Beverage Can Cozy (p. 6). 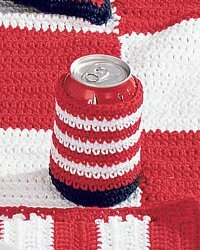 This tailgate accessory is one of those easy crochet patterns that can work for a variety of occasions. Dishcloths are also great when you're looking for free patterns for crochet. A Flower Dishcloth (p. 27) is an ideal spring craft because it's so cute and practical. Learn how to crochet a flower from one of the flower patterns in this eBook. After all, a Crochet Hairpin Rosette can be worn by kids and adults all year long. Download your free copy of 25 Quick and Thrifty Free Crochet Patterns and learn to crochet today! Don't think of "easy" as a four letter word (even if it technically is). Quick and simple crochet patterns for projects such as hats and ornaments can look just as good as more advanced crochet crafts. An Easy Floppy Hat (p. 11) is perfect for anyone that's new to the world of crochet. Free crochet hat patterns can be complicated, but this project really breaks the mold. Additionally, a Baby Blue Hat (p. 31) makes a great DIY baby gift and doesn't take forever to finish. Before you head off to your next baby shower, check out the free crochet baby patterns included in this eBook and save money on a gift. Crochet items like the ones in this eBook are often saved as keepsakes and passed down from generation to generation. This is a great way to leave a lasting impression on someone's life and show how much you care. Not sure what to give a new mommy or growing little one? There are a ton of free hat crochet patterns, crochet patterns for baby and easy crochet patterns for a nursery. Fuzzy Baby Booties (p. 35) are perfect for cold winter months and will provide comfort to a newborn. A Robot Baby Cocoon and Hat (p. 38) is one of those fun and whimsical crochet projects that will make a new mommy smile. Not interested in crocheting homemade clothes? A Heart Baby Room Sign (p. 36) can be hung on a wall and saved forever. These adorable baby crochet patterns show that you don't have to sacrifice creativity and style just because you're new to a craft medium. Instead, take elements of what you already know and use them to discover the awesome crochet projects to make. Take pride in your work and know that your homemade gift will make a huge impression on a new mommy. The crocheted hat patterns in this eBook are meant for everyone in your family - mom, dad, kids and baby! Free crochet hat patterns are perfect for winter but they can work in the summer too. 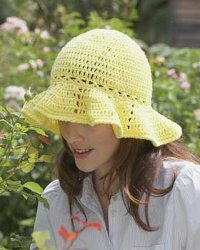 Make a Sun Hat (p. 48) that is as cheery and happy as a summer's day. 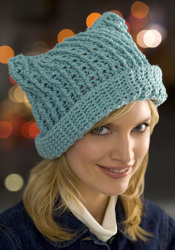 This free crochet hat pattern is stylish and fun to make. Crocheted hat patterns for babies are also a great option for anyone looking to save money on wearables. After all, a baby will only stay little for so long, so why spend so much money? Free crochet hat patterns will always come in handy, so make a bunch for your family or as homemade gifts. 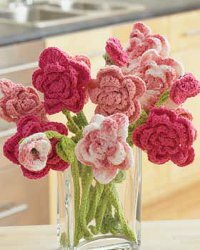 Whether it's sunny or dreary, warm or cold, a bunch of crochet flowers can really brighten your day. These florals don't require water or food - all you need is yarn and a hook. Learn how to crochet flowers and you'll never spend money on a bouquet again! In fact, this eBook even includes free patterns for crochet bouquets of flowers. You will also find easy crochet patterns for floral pins, hair accessories and more. Once you learn how to crochet a flower, you'll find a whole new world opening up in front of you. Turn a boring, gray space into a lovely meadow with a few easy to crochet patterns. There's nothing better! If you're looking for crochet projects that will keep you busy all year long, you've come to the right place. Discover free crochet hat patterns, baby crochet patterns, simple crochet patterns and so much more. These simple patterns make perfect homemade gifts for baby showers, birthdays, Christmas and everything in between. Best of all, you'll save money on expensive, store-bought items. With yarn and a hook, you can crochet everything from a bouquet of flowers to a bookmark. Best of all, these simple crochet patterns don't look like they were created by a novice. Your work will look professional thanks to these crochet instructions on how to crochet a flower, crochet patterns for baby, and even how to make clothing. Additionally, these are easy crochet patterns for bags, dishcloths and decor. Once you check out the free patterns for crochet in this eBook, you might get addicted! Luckily, these easy and inexpensive projects will keep you busy, happy and creatively fulfilled. Whether you're a lover of easy crochet patterns or just want to find out how to crochet a flower, you'll go crazy for the fun and exciting crochet patterns in this free eBook. Five weekly emails with free crafting patterns, tips, collection pages, videos and more + a weekly wrap-up. Be sure to download our free eBook, 25 Quick and Thrifty Free Crochet Patterns today! You'll find patterns for everything from baby booties to hat patterns for adults. Everyone loves a handmade crocheted item, so start working on some today! The one I want to make first is the crochet hairpin rosette that uses the knitting needles frame. I'd like to hear from someone who has tried to crochet this way, is it difficult to learn and how long did it take to make the rosette? Thanks. Great assortment of crafts! A craft for everybody. Everyone who is into any craft should just live this site! love this book its got great stuff i it..i love to crochet too. I think the editors of favecrafts are wonderful. You always respond professionally nomatter how a comment is presented to you. My hats off to you. Love it and adding to my collection. I have several friends expecting a baby and will try some of these patterns. I had no issues downloading. Depending on their system, when you bring up the PDF file, you might want to let it completely load before printing. Sometimes issues arise when pictures do not print is because the file was not completely downloaded before printing. This will depend on your system. Thanks, Twinks! BTW...I have Windows XP, the latest versions of Mozilla Firefox, Opera, and Internet Explorer. downloaded your pdf Quick and Thrifty Crochet ebook...only one picture came through and I already have that pattern. If pics not available, be courteous enough to let people know. I hate loading my computer with useless junk. The felted flower would be great to give to care center residents on any special occasion, like their birthdays to let everyone know it's their special day. Really enjoy this site and all it's great ideas for most everyone. Thanks for the great patterns. I love the bookbag and plan to try it with "Plarn" -- plastic yarn from used grocery bags. What a fab idea, I have never crocheted before, can't wait to have a go, lots of small items. I hope its as good as my sizzix, I love making cards or pictures knitting was to hard for my hands are arthritic, so this sounds like just the job. Hi cjaneghs, If you Google the name of that project, you can find a direct link to the tutorial. Thanks! Rated on: Dec 04, 2010 by Crafter 5139934 the stitch u are wanting to know about is called a post stitch; instead of going through the top of the stitches; you go around the post of the stitch; if u go to you tube and search out front hitch post stitches or back hitch post stitches you can find this...what u do is put you crochet hook from the front around the back of the post(bottom) of the stitch instead of through the top; yarn over and pull through just like you would with a single crochet only around the post of the stitch instead of the top of the row as usual....this creates a knitted look.. I can't wait to get started on these patterns. To save, you can also click on the PDF and once that opens just save it to your desktop and you can open it whenever you want. I like to click the save project button and it saves it to my profile so if I ever lose it I can always come back here and find it easily. If you want to save a pattern, get it up on the screen and then go to the upper left where it says "FILE" , left click, scrool down to "SAVE AS" click on that and then choose where you want to save it to. I find that if I'm working on a pattern I save it to the desktop. Desktop or the place you want to save it to should show in the upper part of the box, choose the place you want to save it to from the list on the left. Then just click "SAVE". I double check that it saved to the desktop by minimizing all your open screens and look on the desktop for the file and double click to make sure it works (opens up). Hope this helps. Does anyone know how to keep yarn already crocheted on a afghan from getting fuzzy while you continue to finish it?Any answers or tips would be very helpful. does any one out there, know the stitch that is crocheted, but looks like it been knitted????? If you us only a slip stitch--it takes longer--but does come out looking like it was knit. Or try the afghan stitch which also resembles a knit look. wow, i like that book! Thank you so much for this great book. I'm always looking for quick and easy patterns. I was unable to download this e book. It kept timing out. I have no trouble downloading other e books from your site. I also have problems with some of the patterns that I can not download. Some really nice patterns. I love the baby hat and cocoon. My daughter in law's daughter is having a baby in Sept. I think there are some nice patterns and some great ideas to work from in creating your own look.